Facebook is giving more organic reach with live video than with a typical post; which is probably currently getting 2% reach. Facebook says that live video has benefits over other types of video because, according to their research, people are 10 times more likely to comment on a live Facebook video than on a regular video. This is important because everything your brand does should be about engaging your audience. Comments are proof that people are paying attention. Facebook recommends that you broadcast for at least 10 minutes so your audience has time to find your content. Real time live – which goes live as things happen. Episodic live video – which goes live on a schedule. They key to this type of content is going live the save day and time each week. This is important to building an audience. The easiest way is to use your phone to go live. You can also use your desktop computer. If you use your computer you may need additional software such as Open Broadcast Software. It gives you more options for going live and is a free open source software. You can also give permission to contributors so they can go live on your page. Whenever possible, use a wired internet connection. This will give you more peace of mind that your video is going out over the internet and that you are giving the live video host the best possible signal you can. Make sure you have a plan for how you will repurpose your live broadcast. You may want to turn it into a podcast or cut it into smaller clips to use on another social media site. 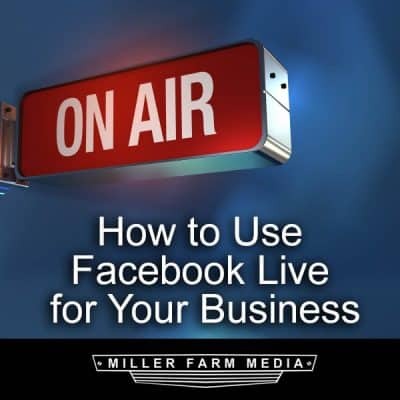 I hope this inspires you to use Facebook live as a way to grow your business. Still not sure? We offer consulting services for brands to help them on their Facebook live video journey.